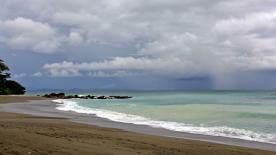 Beachfront promenade, plenty of local interaction, very close to Liberia International Airport. Coco Beach, aka Playas del Coco, is in the enviable position of being both a a tourist hot spot and a local hangout. Its proximity to the city of Liberia and its international airport means locals flock there for a bit of R&R while foreign vacation makers to Costa Rica take advantage of its calm waters and picturesque hillsides. 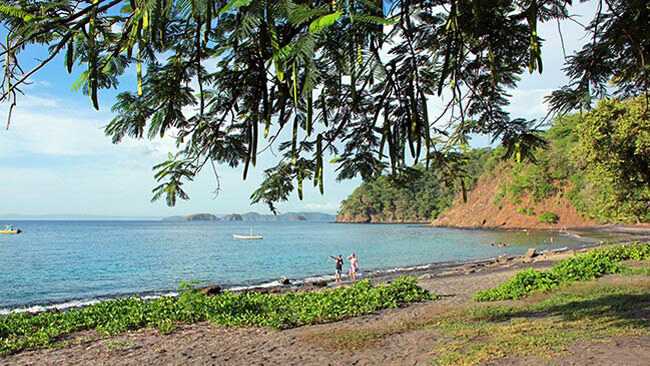 Made up of several small beaches, “El Coco,” as it’s affectionately called, is perhaps only to second to Liberia in terms of most developed towns in the province of Guanacaste. The beach features a winding beachfront promenade with water fountains and even a sports area. The boardwalk has local pipa (chilled green coconut) and snow cone vendors to help cool you down on a hot day. The town itself offers a wealth of souvenir shops but you may find vendors selling trinkets right on the shore. The sand is a dark tan with generally calm waters owing to a sheltered location on the Papagayo gulf; there are some rock formations, so watch your toes. Those calm waters generally harbor a number of small and recreational boats that add to the character of the place. Coco remains a place locals visit consistently so you get a lot of interaction and local flavor. A vast array of bars, restaurants, and shops form the town’s main road, which also leads to the main beach, which is a perfectly positioned hub to go on various tours in the area. Year-end holidays, as well as Easter (and even high season weekends), can be quite busy as local families use their free time here as well. While Coco is family-friendly during the day, night life is pretty active and best for the adults-only set. 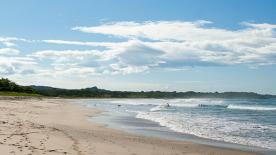 The beach is relatively small and surrounded by hills dotted with villas. Due to the geography there aren’t very many hotels close to the beach. Coco Beach is recognized for its accessibility to supreme fishing areas and scuba diving locations, as well as for being the midway point to Witches Rock, a world-famous surfing spot. From Coco Beach you can also head out to places like the Catalinas Islands and Bat Islands, two areas known for their rich marine life. Coco has consistently warm temperatures year-round. Green season (May-November) sees fewer crowds and more foliage on the surrounding hillsides with afternoon showers. December-April will see more visitors including local and international visitors. Holidays like Christmas, New Year’s, and Easter are very busy. Due to the amount of development, wildlife is limited. Whales will breach occasionally off-shore. Downtown Coco is an exciting party location with dozens of bars and small clubs. Coco Beach has access to modern amenities, including supermarkets, technology stores, and fast food chains. 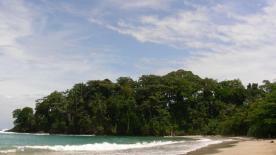 With several properties in development, Coco is one of the most popular towns for relocating in Costa Rica. Just minutes away from the main road lies Villa Buena Onda, one of the country’s most exclusive boutique hotels. The Hard Rock Cafe is a very popular spot in town. A wide variety of amenities are available from local dive bars to upscale supermarkets. Public transportation: Yes, from San Jose with stop in Liberia via Pulmitan Bus.